It started with a motorcycle ride. Like most everything significant in my life, it started with a motorcycle ride. I was working as a consultant, matching would be business owners with new and growing franchises. I was making money, more money than I had ever made. I was helping people realize their business goals and dreams. But inside, at my core, I felt unsatisfied. Like it was good helping other people become more successful in business, but I was unfulfilled. I felt like I was sleepwalking. To wake myself up I walked away from the job and the money and I hopped on a KTM Adventure to ride from Minneapolis to Ankeny, Iowa, my hometown then to Ushuaia, Argentina, the southernmost city in South America. It was to be an epic adventure. It was a trip to remap my life. And it did. But not in anyway that I anticipated. Before I left a family friend suggested I stop in at an orphanage in Cordoba, Mexico, where she had visited, doing medical mission work. I made my way to the orphanage and was greeted with the most open arms I had ever experienced. The kids were magic. Full of curiosity: Donde eres? Donde vas? Where are you from, where are you going? I showed them maps. Where I was from, where we were in Cordoba and where I was heading. You are what? That is crazy? You cannot do that! It's impossible! As I shared my journey with them, I saw a range of feelings in their eyes: wonder, awe, a little fear, and possibility,. Like, if this gringo can ride a moto down the entire hemisphere with just a bag of clothes, maybe I can do that too. After five days at the orphanage, I continued on my trip south. Riding solo, you have lots of time on your own, you, the road and the bike. Lots of time to think. Helmet time. I kept revisiting the kid’s reactions to my visit and trip. It was unintentional, but it felt like I had opened their eyes to possibility and hope. In a small way, I had educated them about a different way of life. I wondered what would happen if they were encouraged to follow their own dreams. Education makes everything possible. You learn math and science and you learn how things are made, discovery and invention become possible. You learn to read and you begin to see the world through other’s eyes and you begin to understand a wider world. Education makes imagination, growth, discovery and invention possible. I came back home at the end of the seven month trip and educated myself about the wider picture of orphans in developing countries. Average life expectancy is 50% less than the average life expectancy of North Americans. Over 130 million orphans in the world. High mortality rate in the young. High rates of abuse and exploitation. High rates of poverty, illness. Being an orphan anywhere is a hard road. Being an orphan in the developing world is a cyclical pattern of poverty, illness and early death that is very difficult to break. And without access to quality education, it’s nearly impossible. Like the right to have clean water, healthy food and safe shelter, education is a right. A moral, human right. There are over 65 million children who don’t have access to quality education. I began thinking how kids growing up in systemic poverty, without parents or family, without school, would be transformed if you provided them with safe shelter, a caring environment and education. And if you provided those basic needs, and rights, over the course of an orphan’s childhood, you would be changing their potential opportunities. One child at a time, one classroom at a time. The end of my South American journey to Ushuaia marked the beginning of a new journey. Which a few years later became actualized with a trip to Uganda, a journey to deliver hope and give education. A journey to transform passengers into riders. A journey to build, fund and sustain schools for orphans in developing nations. 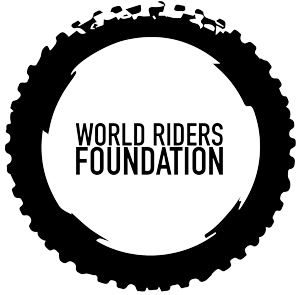 I named the non-profit organization the World Riders Foundation because it brings together my lifelong love of travel and motorcycling with building and sustaining hope for orphans. Please join me and deliver hope to those who need it most.